"Traveller is the work of a decent and honourable man in a world where the deceitful and dishounorable have far too much influence. If you want to be reassured that the word humanity still means something, look inside." "With his unique mix of the personal and political Katakis writes about the world. His verbal snapshots are as evocative and honest as his photographs. They capture the joy of discovery as well as the beauty in variety. He travels as an American who while never forgetting who he is and where he comes from has the heart, intellect and courage to explore and challenge the place of his country in the world. Reading his book is like going on a journey with a friend who never shies of looking and exploring. By the end one is enriched, entertained and gains renewed hope in the shared humanity we share with all other human beings wherever they might be on our beautiful planet." 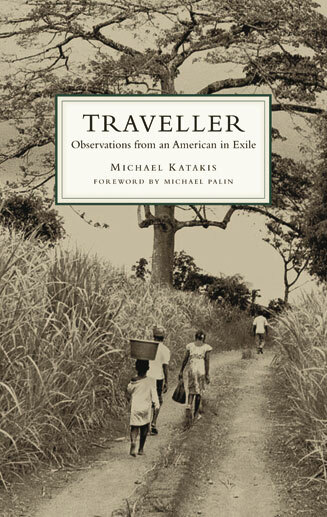 "....Michael Katakis' 'Traveller' is a remarkable work that manages to capture a world in words. 'Traveller' is a deceptively easy book to read, but it ties you up in visions of the past that will haunt you in the present-and stay with you in the future." "Mr. Katakis is a 'real writer'. His letters (In Traveller) reminded me of the best of Eric Newby and Bruce Chatwin. And there is wisdom, and compassion, and the sparkle of life in his journals and letters. The moment of swimming in the sea in darkness, the stars close enough to touch and the comfort of feeling that it was OK that we are so small and insignificant. The prescience of the Muslim girl in Montpellier in 1999 and the little girl with tuberculosis in Africa. Mr. Katakis has created something which is just perfect." "How could I have known then with no maps acquired and my bags not yet packed that my journey had already begun? ...The tools of a traveler are compass and map. They calculate distances covered and destinations sought but cannot measure the consequences of experiences on a human heart," writes Michael Katakis in his introduction. Traveller is a collection of letters and journal entries that bring the immediacy of experience together with perceptive reflections of the authors own past. The entries in this volume are not travel guides. They are personal, like letters from the most desirable sort of friend. This friend carries you with him as he meanders through the medina in Fez or into the hills of Gallipoli. His voice is such that you can almost smell the herbs and dusty soil of Crete. Always you are introduced to the people he meets along the way. For anyone curious about the world, Traveller is sure to delight, infuriate and, perhaps most importantly, inspire thought about the complex world around us.